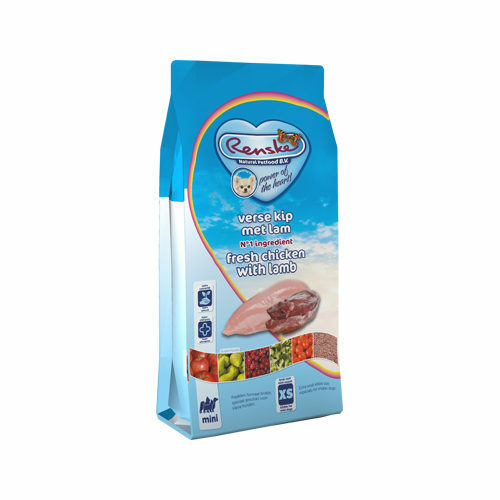 Renske Super Premium Mini is a delicious dry food made specially for smaller dogs. This dog food with fresh chicken and lamb is gluten-free. Thanks to the extra small size of the chunks, it will be easier for your doggy to eat the food. This tasty food will be irresistible for your dog! Renske Super Premium Mini is a delicious dry food for your small pet. This food contains delicious, fresh chicken and lamb. This dog food is gluten-free and extra tasty. Thanks to the smaller chunks, it will be easy for your dog to eat these. Fresh chicken (26%), dried chicken (15%), brown rice, millet, sorghum, oats, poultry fat, beet pulp, dried lamb (5%), dried krill, dried egg, chicken stock, minerals, Brewer's yeast, flax seed (1.2%), seaweed, beta-glucans, dried cranberries (0.04%), dried apple (0.04%), dried tomato (0.04%), dried pear (0.04%), dried broccoli (0.04%), glucosamine (170mg/kg), methyl sulphonyl methane (MSM) (170mg/kg), chondroitin sulphate (125mg/kg). Have you used before? Let us know what you think about this product.